The Daems laboratory has developed a process for increasing the life expectancy of your exceptionally mouldy negatives and films, especially with tri-acetate and polyester bases. This treatment is carried out after the physical restoration of films to be printed (negatives, fine grains, inters, originals, etc.) which have a lot of fungus damage and are sometimes only just recoverable. The aim of the system is to give old material proper protection. After this treatment, spore strains can no longer develop thanks to the absence of oxygen and humidity. The treatment also prevents new moulds penetrating into the emulsion. Your restored items are thus kept in tip top shape for many years. This treatment is tried and tested and the long term result has been witnessed by our laboratory after 15 years' research. Treatment against vinegar syndrome and parching (shrink and stretch), and slowing of mould growth. Especially effective for treating vinegar syndrome stages 1 and 2. Stops acidity developing on the tri-acetate base by ensuring chemical stability (between pH6 and the autocatalytic threshold of 4.6). Isolates the film mat and base from humidity and air to prevent parching (shrink and stretch) and variations in humidity levels. Will not attack adhesive tape. Decreases or entirely removes the characteristic odour, making handling and verification more comfortable. Very easy to remove if needed with a mild solvent (do not forget to protect it afterwards). Can slow down mould damage, although the long term preservation treatment does this much more effectively. The limit for application is stage 3 (pH between 4.6 and 4.4, the threshold where the film enters the irremediable autocatalytic phase. The base is whitish and sticky (very strong acetic acid smell). When this stage is reached, it becomes a matter of urgency to save the film by digital transfer or printing. 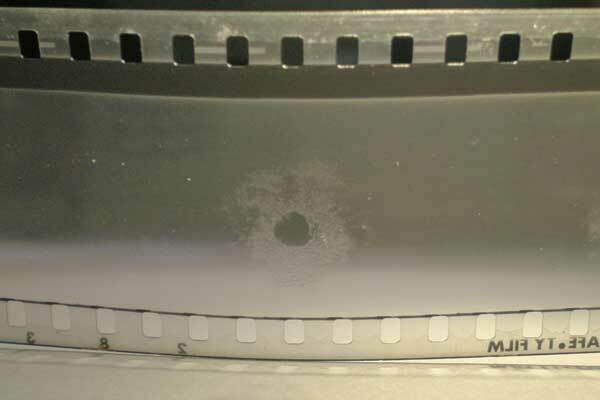 The most important purpose of the treatment is, of course, to ensure the film's pH remains stable as long as possible. We know that long before damaging the film, the vinegar syndrome causes acetic acid to disperse and attack the splices, making the reel mechanically unusable. 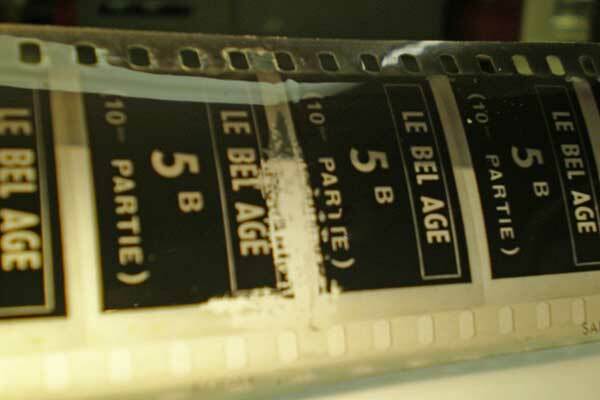 The treatment isolates not only the film but also the splicing tape, thereby preserving the film's mechanical integrity which is indispensable to any kind of use. Moisissures sur l'amorce operateur du film "Le Bel Age"